Storage is key to a well-organized and peaceful bathroom design. Your dream bathroom with a large shower, freestanding tub, and beautiful tile is difficult to appreciate if it is covered in clutter! When planning a bathroom renovation, carefully consider bathroom storage by reviewing both available space and who will be using the bathroom. A guest bath for example may have different storage requirements than a busy shared master bath or kids’ bathroom. While you do not want to overpower your space with too much built in storage, sufficient designated places to keep required items will help maintain a clutter-free, peaceful bathroom. A vanity can be found in most bathroom designs, but you must find one that fits both style and storage requirements. Vanities enhance any bathroom style, and most are a treasure trove of space to organize toiletries and bathroom electronics, like the two pictured below. While you want to maximize cabinet storage space, it is also important to not overpower the room with too large a vanity. The key is to find the right balance of style, size, and storage when selecting your vanity! Once you have the perfect cabinet, fill it with specialized storage accessories to make sure every shampoo bottle, towel, and hairdryer has a home. Include shelves, pull-outs, and drawers, and tailor them with special inserts to fit the items you use most or even add a built-in laundry basket. If your chosen vanity style includes open shelves, use these to display items you want to show off and hide away other items in closed storage or decorative baskets. A wall cabinet, shelves, or a built-in niche is an excellent way to add extra storage without taking up floor space. Position shelves in particular where items must be readily accessible, like these shelves near a freestanding tub. Make use of vertical space and add an element of visual interest in your design with a tower cabinet or open storage tower. The vertical cabinet in this bathroom remodeling project adds valuable storage and also provides a demarcation in the double vanity. Certain items must always be on hand in the shower, like soap and shampoo. 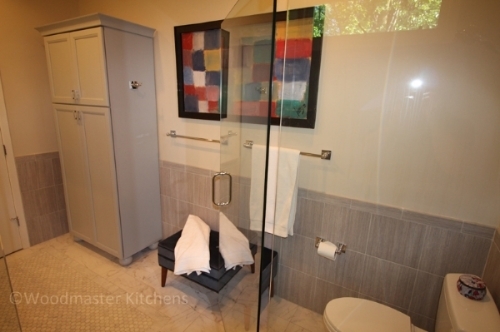 Rather than tripping over them, include built-in shower storage for items you use daily. A niche like the one below left or built in storage shelves like those below right are the perfect way to include handy storage that is also a fluid component of your design. When you have space in your bathroom design, a freestanding armoire can add plenty of extra storage while also enhancing your bathroom style. The two custom armoires pictured below were included in a finish and style to coordinate with the vanity cabinet, but an armoire could also add a point of visual interest in a contrasting style or finish. Medicine cabinets are available in a range of styles and sizes, and are the perfect designated place to keep medical supplies in order. They can even be recessed in the wall to keep your design sleek and clean. The Robern medicine cabinet shown below is a recessed cabinet framed in a wood finish that complements the vanity. No one wants to walk into the bathroom and find towels lying on the floor. Well-placed towel bars and hooks ensure you have an easily accessible place to reach towels and robes when you are stepping out of the shower, like the ones pictured here. You could even add a radiator style towel warmer so towels will be warm when you need them. Storage can make all the difference in your new bathroom by ensuring you have a place for everything and can maintain a clutter free environment. Find your storage inspiration in our bathroom design gallery or visit our showroom to talk to us about storage solutions.